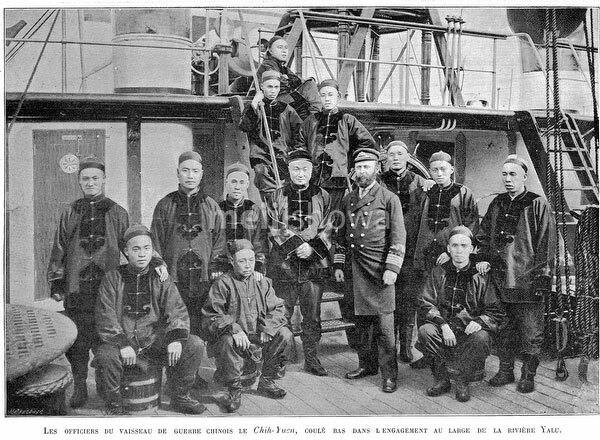 Officers of the Chinese armored cruiser (装甲巡洋艦) Chih Yuen (致遠), sunk at the Battle of the Yalu River (黃海海戰, Kokai-kaisen) during the First Sino-Japanese War (1894–1895). Of the crew of 252, some 245 were lost. The Battle of the Yalu River took place on September 17, 1894 (Meiji 27) and was the largest naval engagement of the First Sino-Japanese War. Published in the French illustrated weekly Le Monde illustré on October 13, 1894.